Aminah Haque is one of those super models whose contributions in the industry of fashion and entertainment definitely played a very important part to make it what it is today. Aminah was one of the most popular faces of Pakistan gracing the ramps and covers of various national and international shows and magazines. Even today if you think of the models who have ruled the fashion industry of Pakistan, her name would definitely be in top three. We are sure that everyone from 90s remember dancing to Awaz’s Mr Fraudiye and loving Aminah. After a few years she created her magic yet again along with Faakhir in Mahi Ve, remember? Aminah has been an inspiration for most of the girls who wanted to enter the fashion industry. She is definitely a role model for most of us out there. Amna decided to quit modelling after tying the knot with the designer Ammar Belal. Now, a recent click of Aminah has been circulating on the internet in which she looks very different from what people remember her, leaving the social media in a shock. Here’s how people are commenting on her photo. We don’t really get why it is so hard for people to understand that people age and they don’t actually look the same forever. And why such negativity? Your mothers, sisters, and daughters are definitely not Katrina Kaif lookalikes then why are people so harsh on our celebs, knowing the fact that have quit the industry as well! The first time we noticed Sumbul Iqbal was when she appeared in the play ‘Ghayal’ where she played the role of a girl who gets raped by her very dear family friend played brilliantly by Gohar Mumtaz. Sumbul then stunned people with her versatility in ‘Neelam Kinaray’ and is now once again stealing everyone’s heart in her current plays ‘Aik Thi Rania’ and ‘Kahan Ho Tum’. This beautiful girl keeps on adding accomplishments to her name and now after conquering hearts in Pakistan, Sumbul Iqbal is all set to go foreign. Sumbul Iqbal is all set to be a part of the Scotland Pakistan Fashion Week as a showstopper for a local designer. “I am very excited to be a part of this as this is the first time that a show like this is happening in Scotland where Pakistan is being represented internationally by our own talented designers for the locals there,” shares Sumbul Iqbal. But for whom will Sumbul Iqbal be walking the ramp, is something which she did not want to disclose at the moment as she wanted to keep it a surprise. With 30 designers participating with three fashion catwalk shows, the Scotland Pakistan Fashion Week is all set to happen at Hotel Crowne Plaza in Glasgow. And with Sumbul Iqbal also a part of it, we for one, look forward to seeing the lovely actress spread her magic all over Scotland on the 16th of March this year! 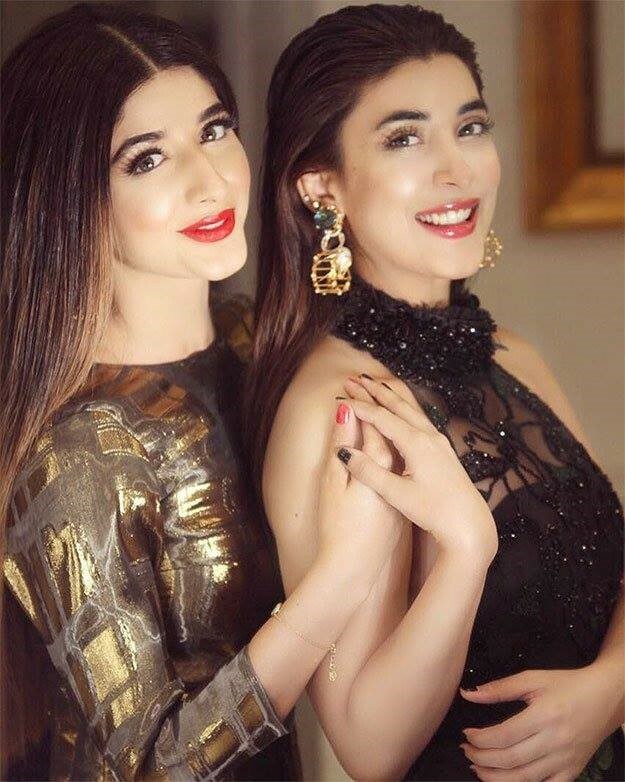 We all know how beautiful and talented the Hocane sisters are. Their popularity in different areas of media did not happen suddenly. They both have separately worked hard on their careers to reach where they are today. Urwa Hocane started as a VJ by applying in a talent show. On the other hand, Mawra Hocane started her career while performing in theaters, then as a VJ and finally as an actress. The two have fought against many obstacles to become successful and we couldn’t be more proud. This one clearly has a thing for UrwaHocane. Meanwhile the sisters are busy being happy with their lives. UrwaHocane was just recently vacationing in Poland and look at how perfect she looks. Bollywood superstar Shah Rukh Khan has a perfect gift for his fans at the beginning of this year. King Khan’s upcoming release is Anand R Lai’s dream project, Zero which stars Katrina Kaif and Anushka Sharma in titular roles. Looking at the teaser, we can say that the film looks quite promising. Zero will see Shah Rukh Khan portray the role of a dwarf, or as the makers like to call it – vertically challenged. It is speculated that SRK will have a double role in the film and Katrina Kaif and Anushka Sharma will be seen playing the love interests. King Khan had a sweet Twitter conversation with Anushka and Aanand before revealing the title. 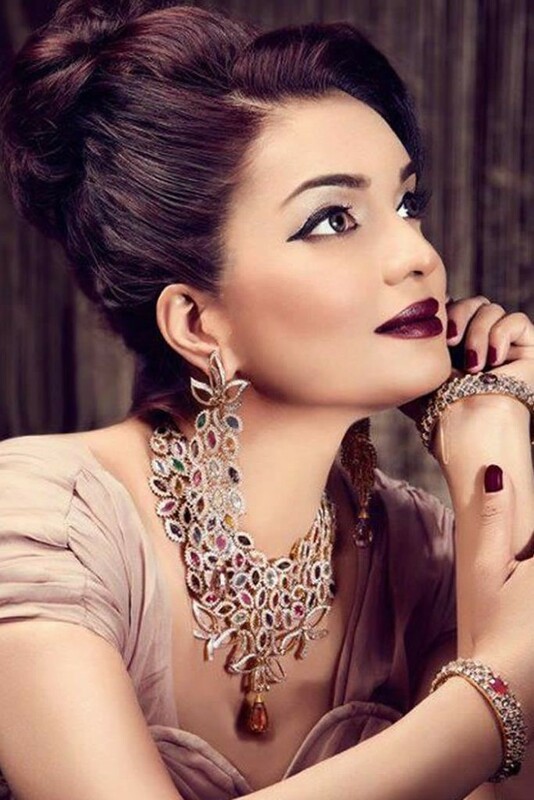 Lollywood’s model and actress Noor Bukhari has been the subject of quite a lot of controversies. She has had many divorces. The actress has now once more been surrounded by the rumors of a fifth marriage. All of us found out when the actress married for the first time in April 2008. She married Vikram when they had been in Dubai and everybody thought about it as a blissful marriage at first. Then rumors had it, that she filed a divorce after a couple of months of marriage when she realized that he had lied about his conversion to Islam. She made efforts to have him convert, but failed and they separated. The actress decided to marry a second time in 2010 with a movie producer/director Farooq Mengal. Sadly, the second marriage was also not fortunate for her as there were reported incidents of bodily abuse and the couple got divorced after four months. Noor Bukhari made another effort for the third time when she tied the knot with Awn Chaudhry in 2012. Alas, the actress is simply not very fortunate with males in her life and as a result of an unhappy life, the couple parted ways, this time attributable to unknown causes. But it seems Noor was unwilling to quit her quest to find true love: She gave it one more shot. In 2015, she secretly tied the knot with Wali Hamid Khan. Again the divorce happened. After her divorce with the singer, she embraced the hijab and decided to become a good practicing Muslim. Now there are rumors of her fifth marriage which have been going around and the media can’t seem to leave the actress alone for considering another marriage. 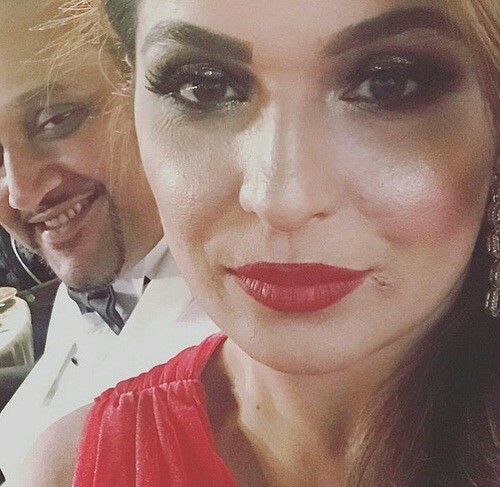 A video clip report by a channel went viral on social media, claiming that Noor Bukhari is all set to tie the knot with her third husband, Awn Chaudhry once more. Saba Qamar has been rising tremendously high lately in her career. With her critically praised performance on a floundering show ‘Baaghi,’ and her Bollywood debut in the acclaimed ‘Hindi Medium’ opposite Irrfan Khan. The actress recently won big at the Masala Awards in Dubai, bagging the Best Breakthrough Performance for the film. 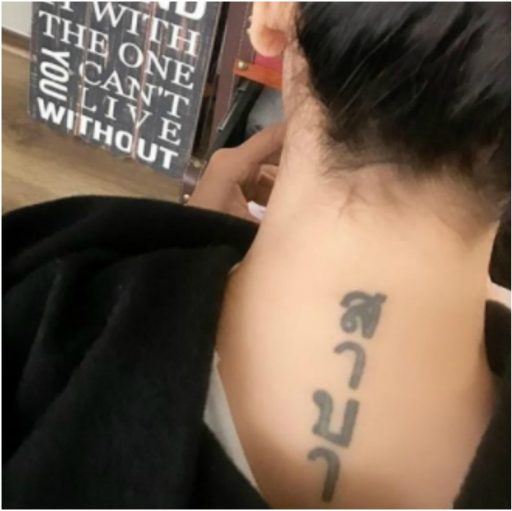 Recently, she shared a picture in which she shows that she has a tattoo on the back of her neck. Whether the tattoo is for an upcoming movie or it’s a personal liking, however, people reacted on it with a love-hate reaction. As sensitive the subject of having tattoos is in our country, people do react to it with complete passion. Have a look at the tattoo, which appears to be in a foreign language, yes, we all want to know what it actually means. Some people did end up loving the tattoo and were quite curious about what it’s about and what language it is. Let us know how this makes you feel. 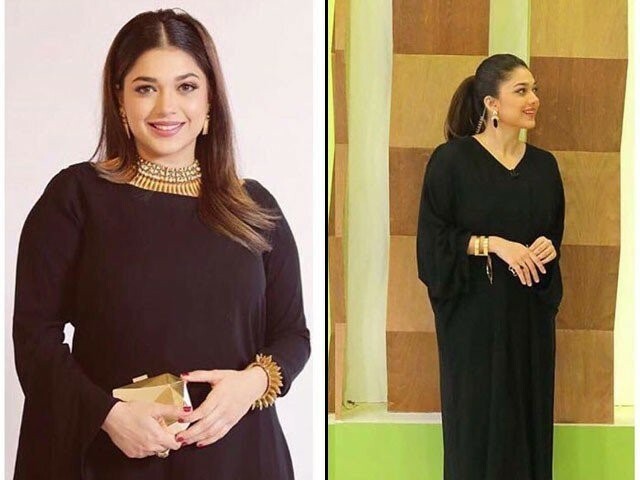 Morning show host and actor Sanam Jung gave birth to a beautiful baby girl, Alaya Qassim Jaffri, in November last year and continued hosting her show, remaining in the public eye throughout her pregnancy and after, slaying with her charming smile, dapper looks and lively personality. The actress was, unfortunately shamed for pregnancy weight gain by some internet users and as awful as that sounds, it didn’t stop the talented star from conducting her morning show. Not that she had to lose any pounds to look like the stunner she is, but it appears to be that the star has been working super hard to get back to pre-pregnancy shape, and guess what, she already has! The Dil-e-Muztar actress recently shared a collage of pictures on her Instagram in which she revealed that she has lost a total of whopping 17.5kg! 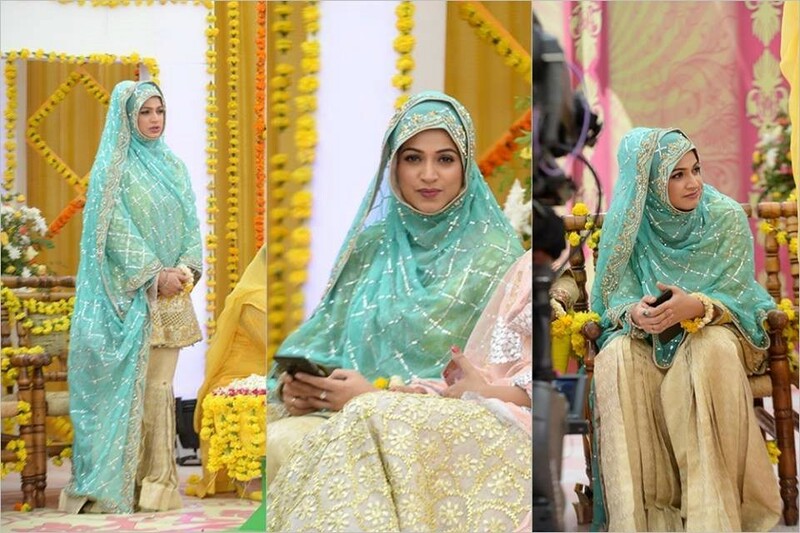 Well, in our opinion, Sanam looks absolutely beautiful in both her before and after looks. This, however, is not the first time an actress has been shamed for post pregnancy weight. Bollywood beauty Kareena Kapoor Khan was also attacked by body shamers after she wore a one-shoulder black dress with a thigh slit to a party. Eastern Eye, a UK based publication recently released a list of top Bollywood debutantes for the year 2017. There was a lot of hype in Pakistani media as two of our actresses Mahira Khan and Saba Qamar also made it to the list. Mahira Khan made her Bollywood debut opposite Shahrukh Khan in the film Raees. Raees was a super hit and Mahira became the first Pakistani actress to join Bollywood’s hundred crore club. She looked beautiful in the role of Asiya and now her role has gotten her a place in the best debutantes list. Saba Qamar also made it to the list due to her superhit ‘Hindi Medium’ opposite Irfan Khan. Saba won hearts on both sides of the border with her portrayal of Meeta in the film and now she is one of the top debutantes also. The two actors have made us all proud and we wish them great success in the future and hope to see more good work from them for the whole world to see. We wondered where Anushka Sharma and Virat Kohli were when the actress’ family were photographed returning to Mumbai yesterday, and now we know. The newlyweds are on their honeymoon, folks, where else? South Africa can wait. 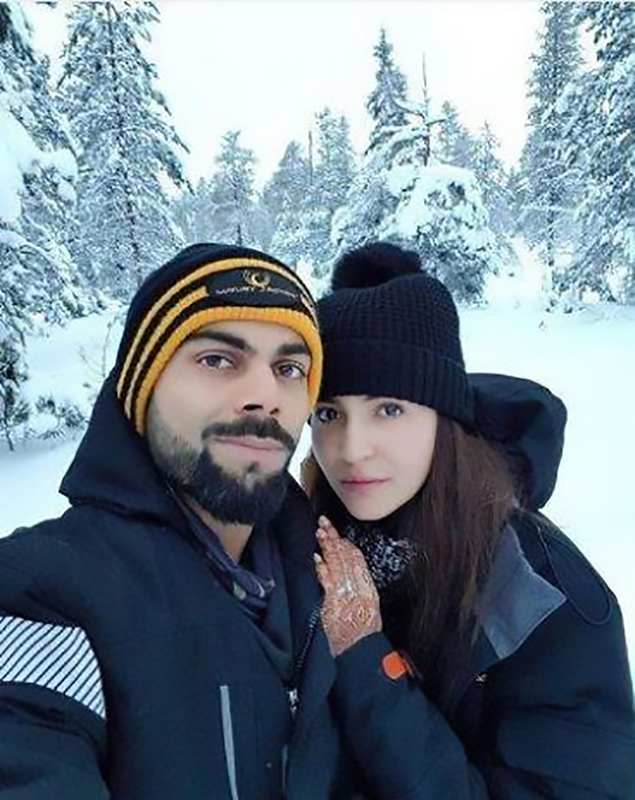 Not sure exactly where they are but from the picture Anushka Sharma posted on Instagram, it seems to be a winter wonderland somewhere in Europe (Italy, where they married? Switzerland?). The photo is a selfie of the newlyweds “In heaven, literally,” the 29-year-old actress captioned the picture. Within minutes of being posted, the picture went viral – it had over two lakh likes in the first 20 minutes itself. Compliments such as ‘cute’ and ‘lovely couple’ have flooded the comments thread. Anushka Sharma and Virat Kohli married in Italy last Monday in a wedding they managed to keep secret (almost) for a year. Rumors they were getting married snowballed last week, and Anushka was later spotted at Mumbai airport flying out to an undisclosed location with her parents and brother. After a speculation-packed weekend, Anushka and Virat married at a Tuscan resort on Monday, making the wedding announcement on their Twitter accounts some hours later. Anushka and Virat will host two receptions later this month – one in New Delhi, which is Virat’s hometown, on December 21; the second in Mumbai on December 26. They will spend the New Year in South Africa after which Anushka returns to resume work of her film with Shah Rukh Khan and Katrina Kaif and Virat stays on to play a series. Anushka Sharma and Virat Kohli will live in Mumbai – he will move cities from Delhi. They will reportedly live in the sea-facing apartment in Worli that Virat bought last year. Meera has always been a controversial personality and her personal life is nothing short of a drama. In the mid of the year 2017, she announced that she was getting married to some mysterious person and didn’t reveal the name, ‘Kyunki Nazar Lagg Jaati Hai’; the wedding was to take place in August. Later it was revealed that the mystery man is Captain Naveed and their Nikkah had taken place earlier and they there was going to be a Rukhsati. The news fire went down gradually and we didn’t see any ceremony. Now Meera was seen with her better half Captain Naveed at the Masala Awards in Dubai. Pakistani actress Meera started her career as a model. She started doing commercials for different products such as Lux and Pepsi at a young age. Meera got famous quickly. She was selected as a best Pakistani actress for film Inteha. Afterwards she did more than 13 projects with many national and international Pakistani celebrities. This lady never stopped her modelling profession and continued it along with acting. Meera still gets offers for films. So, the couple is already moving about together. But when will Meera’s fans see her as a beautiful bride? This is indeed a mystery!